Mε -σχετικά- καλά νέα ξεκινάει η καινούργια χρονιά για την Ελληνική Οικονομία. Ο Δείκτης Μεταποίησης PMI ανέβηκε τον Δεκέμβριο στο 49,6 από 49,2 τον Νοέμβριο για όγδοο συνεχόμενο μήνα, παραμένοντας μεν σε υφεσιακά επίπεδα, αγγίζοντας όμως τα όρια της ανάπτυξης. Όπως όμως αναφέρει στο σημείωμά του ο οικονομολόγος της Markit και υπεύθυνος του δείκτη Phil Smith, “για να επιτευχθούν διατηρήσιμα επίπεδα ανάπτυξης πρέπει να βελτιωθεί η απασχόληση και να αυξηθούν τα στοκ πρώτων υλών των επιχειρήσεων”. The PMI fell agonisingly short of the all-important 50.0 threshold in December, remaining in contraction territory due to further declines in two of its sub-components, namely employment and preproduction stocks. However, the survey data offered signs that an upturn in the business cycle may have already begun, with output levels and new orders rising simultaneously for the first time since August 2009, albeit only slightly. Growth in new orders will need to be sustained before an outright recovery can be declared. “Greece’s manufacturing sector ended the year on a positive note, with output increasing for the second successive month on the back of a rise in incoming new work. Employment levels fell further, however, matching the trends in purchasing activity and backlogs of work. Input price inflation meanwhile remained only marginal, providing firms with scope to lower charges. 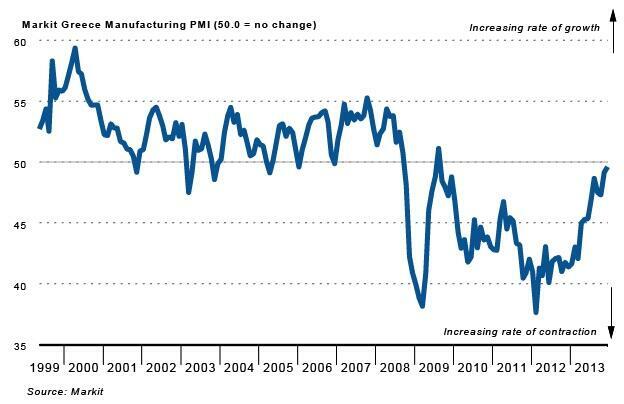 The headline Markit Greece Manufacturing Purchasing Managers’ Index® (PMI®) – a composite indicator designed to provide a single-figure snapshot of operating conditions in the manufacturing economy – climbed to its highest level in more than four years in December, registering at 49.6, up from November’s reading of 49.2. December’s survey showed a second straight monthly increase in output at Greek manufacturers. Although the rate of growth was faster than in November, it was still only modest. As was the case in the prior month, December’s expansion was centred on the consumer goods sector, with further contractions in intermediate and capital goods production weighing on the overall level of output across the sector. Underpinning the latest increase in production was a rise in incoming new work at manufacturers. With new export orders falling again during the month, the expansion in total new business was attributable to stronger demand in the domestic market. backlogs of work. Moreover, the rate of decline in outstanding business was slightly faster than in the month before. December data also signalled an accelerated reduction in the level of purchasing activity among manufacturers. Combined with higher output requirements during the month, this in turn led to a decrease in pre-production inventories, and one that was the most marked since September. Stocks of finished goods on the other hand decreased only marginally, and at the slowest rate in the current sequence of decline. Supplier delivery times increased on average in December, which panel member reports suggested was largely a consequence of a lack of stock at vendors. The rate of lead-time lengthening was the sharpest in five months. Θετικό νέο οπωσδήποτε η άνοδος του δείκτη Μεταποίησης PMI σε υψηλά 4½ ετών αναδεικνύονται όμως τα εμπόδια για την επάνοδη στην ανάπτυξη: Η χαμηλή απασχόληση και η έλλειψη αποθεμάτων των επιχειρήσεων. Για να επιτευχθούν όμως αυτοί οι στόχοι χρειάζεται επαναφορά της εμπιστοσύνης στην αγορά, βελτίωση της κινητικότητας στην αγορά εργασίας και ρευστότητα. Και οι τρεις αυτοί όμως καθοριστικοί παράγοντες εμποδίζονται από την πολιτική ατολμία -ίσως και απροθυμία- στη Κυβέρνηση, την αναβλητικότητα της Ευρωζώνης για την ρύθμιση της βιωσιμότητας του Ελληνικού χρέους και την εκκρεμότητα του δεύτερου κύματος ανακεφαλαιοποίησης των Ελληνικών Τραπεζών. Αν μπορούσαν να βρεθούν λύσεις στα τρια αυτά ακανθώδη ζητήματα, η Ελληνική Οικονομία θα επέστρεφε ξανά σε ισχυρούς ρυθμούς ανάπτυξης. This entry was posted in Ελληνική Οικονομία and tagged economy, euro, Greece. Bookmark the permalink.